Hanging in the office of James A. Bradley, the founder of Asbury Park, was a display showing photographs of city pioneers: builders and contractors and a surveyor, a newspaper editor and tinsmith and postmaster, the mercantile pioneer Henry Steinbach, and even an undertaker. Palace from across Wesley Lake in 1901. These were the men who had transformed Asbury Park from 500 acres of undeveloped seaside property - purchased by Bradley in 1870 for approximately $90,000 - into a top tier summer resort, in less than 15 years. Arriving in town too late to be considered a local pioneer, Ernest Schnitzler, the creator and first owner of the Palace, was in every other sense of the word Asbury's first great entertainment entrepreneur, and his Palace stamped a pioneering influence on life along the shore. Schnitzler's reputation for innovation, creativity, and for maintaining a family-friendly environment were such that by 1902, editor William Nelson of "The New Jersey Coast in Three Centuries (Vol III)" described the Palace as "the largest, most unique and most complete" amusement park "under one roof of all found on the Atlantic coast." The Palace, he wrote, was "an exceptionally refined place of amusement, admirably well adapted for ladies and children, and has been delightfully visited and revisited by thousands of foreigners as well as Americans." 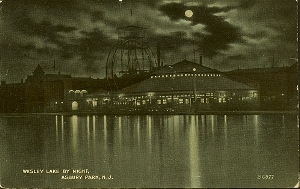 Palace at night from across Wesley Lake in 1913. In part, Schnitzler earned his reputation as a pioneer by refusing to stand still. In the Palace pavilion, for instance, the original power source was a steam boiler in the northwest corner, put in to drive the carousel. Within seven years, Schnitzler had added two electrical generators known as dynamos - the first generators powerful enough to deliver electricity for industry - and used them to turn the Palace into a gaily lit space. According to the June 19, 1895 issue of Asbury Park's The Daily Press, the dynamos were capable of illuminating "2,000 thirty candle power lights, and it is expected that nearly this number will be needed during the height of the season." The newspaper said Schnitzler had also changed much of the machinery since the end of the 1894 season, refitted all the gas fixtures, and adding "several hundred new selections of music for the grand orchestrion, embracing the most popular airs of the day, as well as the choicest of classical music. Oil paintings embellish the walls, and flowers and palms beautify the room. Taken altogether, it is a place where one can profitably spend a pleasant half day or evening." Schnitzler also earned his stripes with an unerring business sense. The year 1903 was troublesome for Asbury Park, marked by a struggle between the City Council and James Bradley over control of Bradley's waterfront properties. The City won, but victory brought a lengthy reassessment of the waterfront that unsettled many residents. As the political debate continued, Schnitzler acquired and cleared a 31-foot by 100-foot lot immediately west of the revolving wheel. On the lot, he built a two-story steel and masonry building that was connected, at ground level, to the rest of the Palace. When the new building opened for the 1903 season, Schnitzler had moved the Crystal Maze from its original spot in the Palace pavilion into the ground floor of the new building, and moved his family into a second floor apartment designed by architect Ernest Arends and constructed by R.E.K. Rothfritz (masonry), Israel Taylor (carpentry) and the firm of Forsyth & Boyce (plumbing). Widely praised in the media, the expanded Palace helped Asbury Park retain its image as an trend setting resort during a period of period of significant political turmoil. By then, the success of the Palace had whetted Asbury Park's appetite for fun all along the boardwalk. Writing in 1902, Nelson said "amusement halls and pavilions are found at every little interval." Just around the corner from the Palace was a block long triangle of property where Cookman and Asbury Avenues came together. When Schnitzler opened the Palace in 1888, there was but one building there; by 1905, it had been torn down and replaced by a festival of amusements, including a salt water swimming pool, hot baths, a bowling alley and ice cream parlor, and a game parlor. 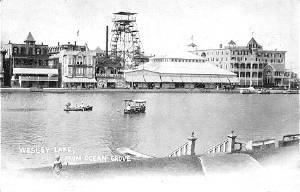 A little further to the north, in the block fronted by Ocean Avenue between 2nd and 3rd Avenues, businessmen opened The Old Mill Amusement Palace, featuring a frame steeplechase and an underground boat ride that ran beneath the sidewalks of Ocean and 3rd Avenues and under parts of the huge building. The fun zone was not all games and merriment. Racial tensions had been on the rise from the day in 1883 when James Bradley tried to "protect" guests and cottagers from insults by "disreputable" servants by barring blacks from his boardwalk. Nor could blacks rent swim suits or use changing rooms (until, in July of 1889, when Bradley agreed to black bathing privileged from 5 to 7 a.m.) Tensions spilled over into the Palace on the night of June 25, 1889, when William Nelson, a black employee of an Asbury ice cream manufacturer, stood watching the carousel. A Palace security guard, W.E. Carney, ordered Nelson to leave, and when he refused, Carney summoned the Palace bouncer, John A. Krause, who tossed Nelson outside, triggering a fight apparently won by Nelson. Both were arrested and fined. The following day, with blacks demanding the right to ride the carousel, Schnitzler announced that admission to the Palace would be restricted to season ticket holders, at a cost of $25 a ticket. In the words of The Shore Press (June 28, 1889), "the tickets were then freely given to the white people, but none to the colored folk, and it is scarcely necessary to say that they did not buy any." Schnitzler later decided to let blacks ride after 10:30 p.m., prompting the Shore Press to report: "It is probable that no future trouble will result. Schnitzler owned the Palace for over 30 years, and before finally selling to August Williams, steered the Palace through one more crisis with the same level of determination that had helped him overcome the Great White Hurricane of 1888. In 1910, fire seriously damaged the Palace carousel, destroying a number of original Looff animals. To manage the reconstruction, Schnitzler turned to William Mangels, an engineer and ride manufacturer from Coney Island, who expanded the carousel to four rows, added a jumping mechanism, converted to electric power, and replaced destroyed animals with ones newly carved by Marcus Charles Illions of Coney Island. The Palace was not affected by Asbury's most famous blaze, the $1 million fire in 1917 that razed homes, summer hotels and the First Methodist Church in a four block stretch from the boardwalk to Grand Avenue.